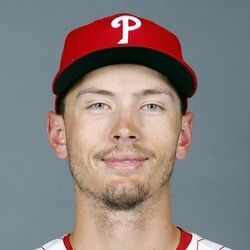 Phillies beat the Marlins 4-1 thanks partially to Tyler Goeddel who knocked around Wei-Yin Chen hitting a homer bringing in two runs in the first inning and singled in the second inning driving in a third run. Tyler Goeddel has had only three hits in his last 30 at-bats. He is only worth a chance as a cheap filler in DFS action.